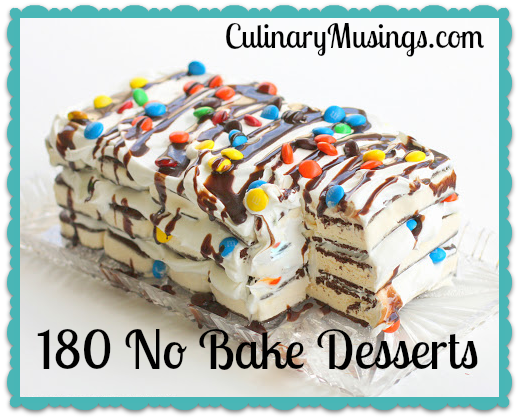 180 Heat-Busting Desserts - No Bake Desserts Roundup! I have a pinboard and a bookmarks folder full of dinner and dessert ideas that are perfect when it's 90 degrees out. Yesterday was our first 90-degree day - and I was miserable. I started digging through my board & Bookmarks for some dinner ideas and realized my bookmark was gone. Oh the tragedy! I was so sad. I started from scratch and found some great posts that have a lot of ideas in them. But I wanted somewhere better to keep them. Well, why not a blog post that is saved forever on a blog - never to disappear in a browser mishap? Great idea! There are way too many recipes to put them all in one post, so I'll break them down. Today let's do desserts! Below find links to 180 of my favorite no-bake dessert posts from around the internet! 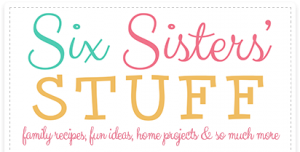 Friday Fun List: 50 Easy & Delicious No Bake Desserts - From SixSistersStuff.com. This is a great blog for easy to make and fun recipes. I go to them many times when I'm looking for something that looks great but is really simple to make. Their no bake desserts include the iconic No Bake Cookies as well as Muddy Buddies and Peanut Butter bars. Definitely a great resource! 16 No Bake Desserts from Cooking Light. - When I first started seriously cooking - about 10 years ago - I had a subscription to this magazine. Their recipes are great, they cut some caloric corners, and they're generally easy to make and have ingredients that are easy to find. My favorites on this list are Last Minute Tropical Sherbet and the Limoncello Freeze. Definitely a keeper! Easy No-Bake Dessert Recipes from AllYou.com - Love these 14 quick and easy desserts. I imagine if you like pudding (I'm not a fan) then you'd like the Lemon Graham Icebox Cake. My favorites are the Watermelon Limeade Slushie and the Ice Cream Bon Bons. EasyRecipes: No-Bake Desserts from RachelRayMag.com - This is a list of 40 no bake dessert ideas, not necessarily "recipes" but do you need a recipe for everything? Her ideas for Fruit Sushi and Unbaked Alaska are great. Also the Amaretto Sour Slushie is FABULOUS - I only use Gozio Amaretto! 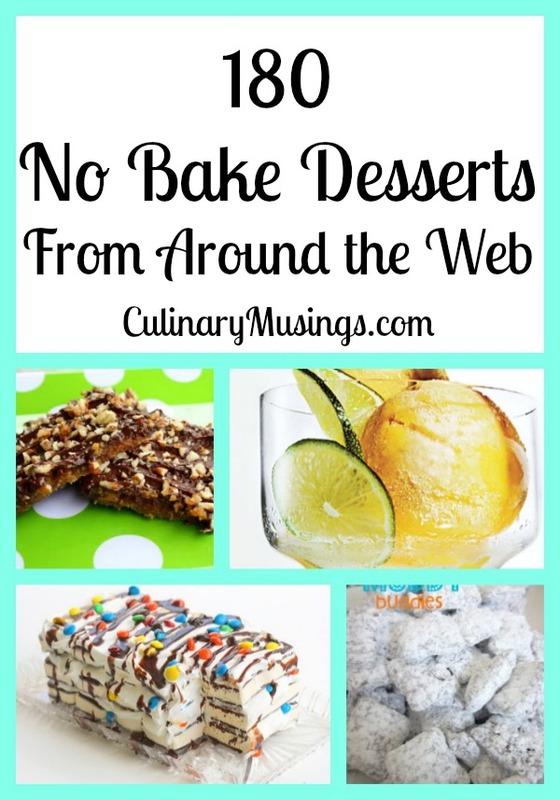 No Bake Desserts from The Girl Who Ate Everything Blog - I love this blog - not only is the writer witty and very easy to read, her recipes are very fun and easy. She has 28 great recipes here, but the top prize goes to the Ice Cream Sandwich Cake. This is a pretty impressive and tasty dessert for family or entertaining as long as you can keep it in the freezer - It cant travel very well. Her Grammie's recipe will blow you away as well! No Bake Desserts from Paula Deen - 7 Tasty Treats here! I know there are a lot out there who don't like Paula - but I love her, I kinda wish she was my gramma. Of course, we'd both be on Diabetes medicine if she were - because my love of butter and bacon and her enabling would ruin me forever. Big winners on her list are Low Country Cookies and Bobby's Rice Pudding.